How can I take leave of absence? How much internship must I still fulfil? How does the exam registration work? Answers to these questions and more are available in the Studienhandbuch. Since first of December 2015 all theses (Abschlussarbeiten) are provided to the first examiner in digital form including the corresponding plagiarism report. 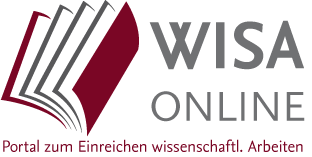 The date of the upload process in WISA Online will be posted as a binding delivery date of your thesis in the data management. For complete delivery of the thesis at least two bound copies must be submitted immediately after the upload to the supervising institution including the delivery certificate. 1. that you have to upload your thesis in time under WISA online. 2. that you print and sign the delivery certificate. (after successfully uploading you will receive a confirmation e-mail with attached delivery certificate). 3. that you have to submit two bound versions of your thesis together with the signed delivery certificate to the supervising institution as soon as possible (preferably on the very same day of uploading) . Please schedule early on the new process to submit of your thesis, ensuring deadlines are respected. Study and project work (Studien- und Projektarbeiten) will be uploaded only for the purpose of plagiarism control. The digital version of your work is not forwarded to the first examiner. Study and project work have to besubmitted at the supervising institution. For the upload process you need a TAN. If you are interested in the courses offered by the Faculty of Mechanical Engineering, take a look at the course catalogue. You will find information about times, lecturers, credits and the content of the lectures, practicals and tutorials. All exam-related information, including e.g. checklists for exam registration, is available at http://pos.tu-bs.de. The students are required to achieve 4 credits from non-technical modules during the bachelor degree course (Mechanical Engineering and Industrial Engineering / Mechanical Engineering) and 12 credits during the master programme (Mechanical Engineering and Industrial Engineering / Mechanical Engineering). You can attend all courses offered at the TU Braunschweig as long as they are not part of your bachelor or master degree course (for Diplom programmes Mechanical Engineering and Bioengineering according to the appendices of the examination regulations). Furthermore, the modules have to include an exam. The “pool model” of the TU Braunschweig can be used for orientation: https://vorlesungen.tu-bs.de >> Vorlesungsverzeichnis >> *Besondere Verzeichnisse* >> Pool (überfachliche Qualifikation). You can also use the following list . Please note that the focus is on interdisciplinary skills. You will learn and train soft skills required in practice (e.g. presentation techniques, ability to work in a team and project management). These courses will also be mentioned in your Transcript of Records as a proof of the skills you acquired. If you get a grade for the courses, it will be listed on the final certificate. This list also applies for Diplom students!